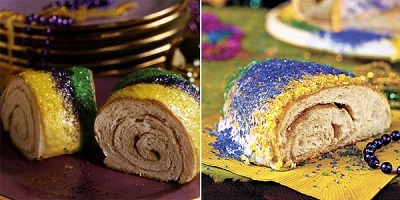 A King Cake is a large yeasted cake that is similar to a coffee cake or a kringle. It is typically made with a Danish dough that is filled with cream cheese, praline or a swirl of cinnamon sugar and twisted into a large oval shape. The cake is baked and drizzled with a white confectioners’ sugar glaze and topped with green, gold, and purple sugar crystals. Some cakes come with a glaze that has had the color added to it directly, rather than being added in the form of sprinkles. 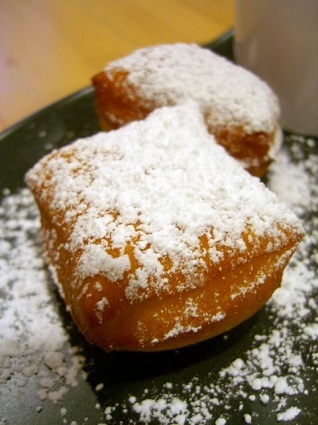 It’s a staple of Mardi Gras celebrations in Louisiana, and is widely available at bakeries throughout the rest of the US around Mardi Gras. Traditionally, small trinket or plastic baby figurine is inserted into the cake after baking and whoever gets it in their slice is supposed to provide the next King Cake, however many bakeries exclude the trinket due to the choking hazard posed by them. Since it is closely associated with Mardi Gras, the celebrating preceding the Catholic observance of Lent, it shouldn’t be a surprise that the cake gets its name from the three biblical kings – or that the season for the cake lasts from just after Christmas all the way to Mardi Gras. But these days, Mardi Gras is largely a secular celebration known for indulgence and parties and many people observe it just to have an excuse to buy one of these colorful cakes.